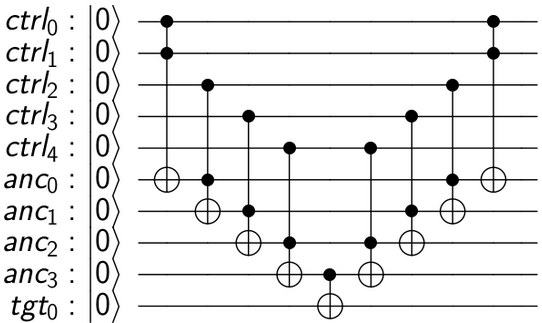 A simple way to do this is illustrated in Figure 4.10 of Nielsen & Chuang. Where U can be any single-qubit rotation (in this case, an X gate). This circuit works like this: We want to apply U to the target qubit only if the AND of all control qubits is 1. A normal Toffoli gives us the AND of 2 qubits. 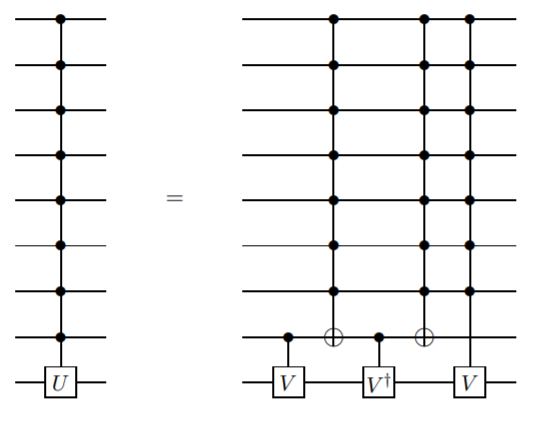 So by chaining a few Toffolis, we can get c1.c2.c3.c4.c5, with the catch that some "work" (or ancilla) qubits have been introduced to store intermediate results. After applying the final CU, we get the final result in target. 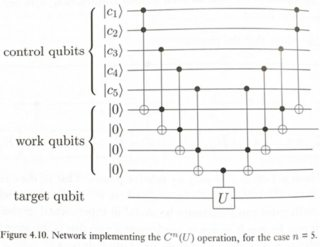 Now we can clean up the intermediate work qubits by undoing their computations, returning them to the |0> state. This model of reversible computation is known as the "compute-copy-uncompute" method, and was first proposed by Charlie Bennett in 1973. This is a recursive definition, so the control n qubit gate is defined in terms of the control n-1 qubit gate. This would continue until you reach the two qubit gate CNOT. This implementation is a little difficult, however, a simpler one exists if one does not mind collecting a relative phase (see Lemma 7.9 of the same paper). To implement a gate such as $V$ in QISKIT, you will need to use the advanced single qubit gates.